The healthy females of this breed usually grow to 33cm in height and weigh 6.8kg, while the males grow to 8.2kg and stand at 39cm. A Fox Terrier requires a lot of company, plenty of exercise and preferably some time for relaxation. In return your Foxie will give you undivided loyalty. When walking your dog, always have it on a lead. Fox Terriers can be very single-minded when they see something of interest, perhaps across the road and will chase after it – often with disastrous consequences. 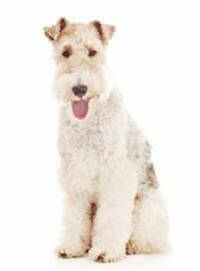 There are two types of Fox Terrier – one with a wire coat and one with a smooth coat. The wire coated variety has a harsh wiry jacket which requires a lot of attention if the dog is to be kept looking smart. The coat needs to be clipped into shape about four times a year, combined with regular brushing. The Fox Terrier makes a good companion and watchdog for families and the elderly. It is an excellent children's dog as it loves to join in ball games, playing catch, skateboarding, even swimming and surfboard riding at the beach.